RFID and the Internet of Things as we understand it today, have a strong historical relationship with manufacturing, warehousing, consumer goods and retail. Kevin Ashton, who coined the term Internet of Things, in fact was working as a marketer at CPG brand P&G when co-founding the MIT Auto-ID Center and was directly inspired by a challenge in retail. The challenge was related with logistics, supply chain management and inventory management, all elements which are key for retailers. So it shouldn’t come as a surprise that the Internet of Things offers great opportunities in transportation and logistics but also in the digital transformation of a crucial shackle of many supply chains: retail. Moreover, retailers have worked with RFID since quite some time. With the advent of additional technologies and improvements in sensors, better connectivity and communication solutions and new devices, which led to the Internet of Things as we define it today, the opportunities to improve operations and offer the personalized and immersive experiences customers want are even bigger. Obviously there are also benefits in e-commerce operations. So, supply chain management and logistics is one area where the Internet of Things is important in retail. In a just-in-time retail reality with cost pressures it’s crucial that processes are optimized and here the IoT is an enabler and a cost saver. This isn’t only the case in the context of the retailer who sits at the end of a supply chain. In an increasingly converged retail reality, goods also need to be shipped to the consumer, if they aren’t bought in a physical store, and here as well the Internet of Things plays a role in retail logistics. With new developments in areas, which sound more futuristic than they really are, such as drone deliveries, new opportunities arise in this regard as well. Retailers sit in a unique position: they are the ones who are directly in touch with the end customer or consumer. Expectations with regards to customer experience, service, speed and efficiency play a far more important role for today’s channel-agnostic and connected, mobile consumer. While logistics can play a key role in meeting these demands and providing better customer experience and service (for instance by using track and trace with full visibility for the impatient consumer), there are many other areas where the Internet of Things can help enhance customer experience as we’ll cover. From digital signage and self-checkout to smart mirrors: they all can play a role. According to a June 2017 report with IoT investment data, IDC stated that in-store contextual marketing will be one of the fastest growing cross-industry IoT use cases between 2017 and 2021 with a 20.2 percent CAGR. It obviously will play a major role in retail as well. In its 2016 Internet of Things report, Verizon showed various use cases in retail IoT. Retailers are also positive about many aspects of Internet of Things deployments, Verizon found. 77 percent of retailers see that Internet of Things changes the customer experience. 89 percent of early-movers in retail gain increased insight into customer preferences and behaviors from the Internet of Things. 77 percent of early movers in the Internet of Things in retail create opportunities to better collaborate with (new) partners in delivering products and services to customers. More in the infographic and the report. As we saw in our definition of the Internet of Things, one of the key characteristics is that it builds a bridge between the physical and digital world. And where else is bridging digital and physical worlds a crucial phenomenon that is going on since many years to serve our channel-agnostic consumer who wants frictionless experiences where, when and how he wants, regardless whether they are digital or physical? Exactly: in retail. We’ve been bridging digital and physical or brick-and-mortar retail environments since ages. There are ample technological solutions to do so and several of them are about the Internet of Things. Digital signage is a main area where the combination with IoT leads to new forms of engagement in retail. With the use of digital signage in IoT, personalization, information and context are essential, thanks to the connection with data (analysis) and sensors, for instance based on movement or gesture recignition or the possibilities offered by various data-generating IoT-enabled devices, depending on the situation. It is one of many ways retailers use to connect physical and digital, certainly when touch is involved. Below is a retail example with gesture recognition. A key pillar of the bridges between digital, physical, processes, business goals and customer experience is of course (big) data. Or better: data, turned into actionable information and intelligence. That is also what the Internet of Things and data analytics are all about. It’s clear that with several Internet of Things applications in areas such as dynamic pricing, smart shelves and inventory management, and a whole range of customer-oriented innovations within the physical retail store environment it is possible to achieve multiple potential outcomes. Several of these applications are already mainstream today or part of broader solutions. But it doesn’t end there. 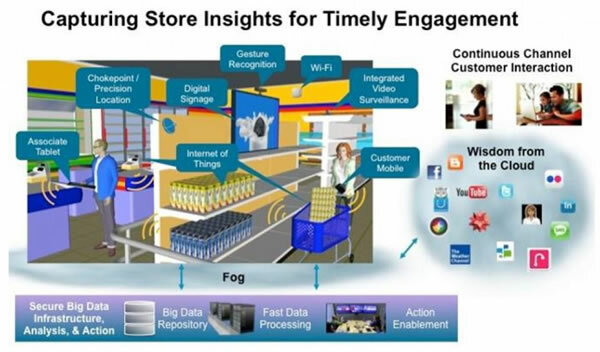 There are many more Internet of Things benefits and use cases in the retail industry. It’s important to note that the IoT initiatives, and in general digital initiativesn in retail pay off most in the optimization of processes and logistics. The infographic below from Manthan gives an overview of more use cases and applications of the Internet of Things in retail, from vending machines, interactive displays, virtual closets and smart mirrors to smart dummys, self-checkouts, the previously mentioned digital signage, connected cameras and smart shelves. A noteworthy ‘prediction’ from the infographic: with the usage of RFID tags, retailers can expect 99 percent inventory accuracy, a 50 percent reduction in out-of-stocks and a 70 percent reduction in shrinkage. A specific technology that could change the face of retail and IoT is in the usage of M2M digital signage and the indoor wireless visual communications technology LiFi (Light Fidelity). Simply put visual communication technologies use visual light to enable wireless connectivity. LiFi is seen as a potential replacement of beacon technologies in retail which seems to be its main adopter. According to a report by TechNavio retail is the main segment where this technology is used and will be used until 2020 (although there are far more LiFi use cases). It’s extremely fit to offer shopper fast mobile connectivity and thus increase customer experience and enable location-based interaction with promotions and so forth. Moreover, LiFi will play a key role in IoT and if there is any environment where there is a lot of LED lighting with opportunities for marketing and customer engagement it’s certainly in retail. As LiFi standardization has started and prices are expected to drop it’s definitely an area to watch with more retailers expected to embrace LiFi. Quoting from the TechNavio report landing page: “The advent of IoT-enabled Li-Fi is a major factor spurring the growth prospects for this market during the estimated period. Generally, IoT uses several technologies such as RFID, sensors, barcodes, and GPS, and helps monitor and manage physical assets in an organization. With the aid of IoT, every device or asset of an organization can be interconnected with other assets. As a result, retailers from across the globe have started using M2M-based digital signage to provide users with essential information about their new product launches, latest additions in product lines, and discounts”. Top picture: purchased on Shutterstock. Copyright: Amirul Syaidi. All other pictures: see mentioned owners in image description and links.